For well over a decade, the sensitive nuclear fuel-cycle activities of the Islamic Republic of Iran have been at the center of international concerns about the further spread of nuclear weapons. 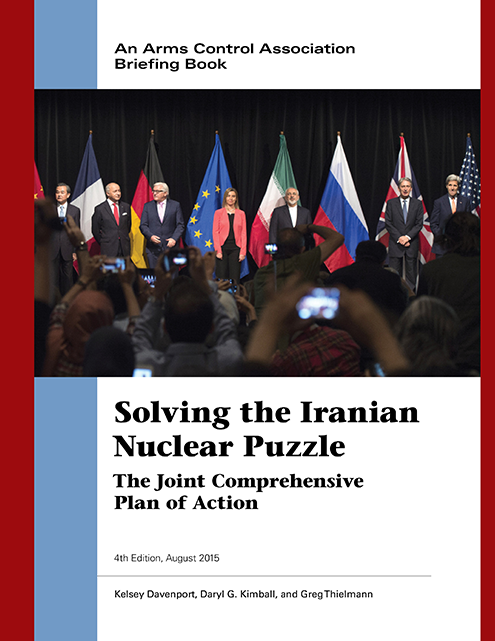 On July 14, negotiators from the P5+1 (China, France, Germany, Russia, the United Kingdom, and the United States) and Iran secured a comprehensive nuclear agreement—the Joint Comprehensive Plan of Action (JCPOA)—which is designed to verifiably block Iran’s pathways to nuclear weapons development and guard against a clandestine weapons program in exchange for sanctions relief. a summary of the Iran-IAEA work plan on verification and compliance issues. Our briefing book is intended to improve public and policymaker understanding of this complex agreement with far-reaching consequences for the nuclear nonproliferation regime and for international peace and security. *These Fact Sheet versions are updated on an ongoing basis. This report was made possible by the generous support of our members and donors, without which this report would not have been possible. In particular, we wish to thank the Carnegie Corporation of New York, the William and Flora Hewlett Foundation, the John D. and Catherine T. MacArthur Foundation, the Ploughshares Fund, and the Prospect Hill Foundation, which provide support for our research and public education programs on nuclear nonproliferation issues.